This isn’t really road-related, but I figured people who read this thread might like the photo. 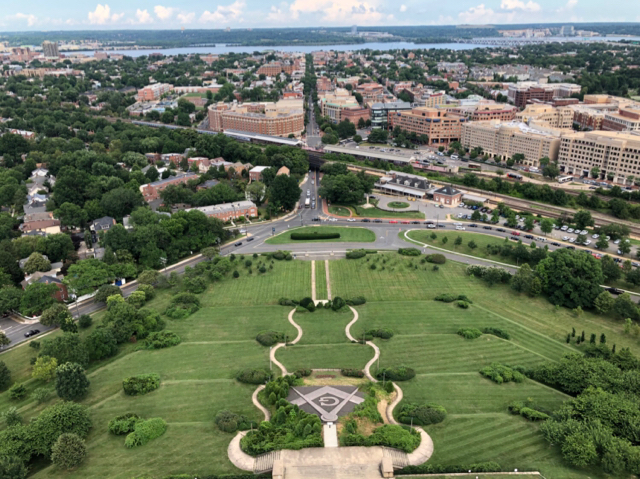 Our relatives from Fort Myers visited us this week and yesterday we went to Mount Vernon and the George Washington Masonic National Memorial. I had been to the latter once more than 30 years ago but didn’t remember much. This is the view of Old Town from the top (you can also see the Wilson Bridge, National Harbor, and the MGM). It’s well worth the $15 for the tour. You can actually go inside of the Masonic National Memorial? I did not know this. I will have to check it out. They could use better publicity. I think a lot of people think it’s closed to the public, like the Mormon Temple, and I’m sure the common misuse of “Masonic Temple” (its not a temple) probably plays into the misconception. We found it interesting. Lots of stuff about George Washington and his Masonic activity, which you don’t hear about at Mount Vernon. Lots of artifacts from his life, too. Of course the view from the top is the main thing. The elevator is of some interest. Note the shape of the memorial. The elevators (there are two) run up inclined shafts instead of straight up and down. There are only 20 such elevators in the USA. I think it’s worth going if you haven’t been there before, especially if you know the area well. If your goal is to view DC, I’d say to go to the Old Post Office Tower (free—enter through the back of the Trump Hotel next to Starbucks from 12 Street) or the Episcopalian National Cathedral on Wisconsin Avenue (take the elevator to the 7th floor observation level). But to view Virginia, especially Alexandria, it’s hard to beat the Masonic Memorial. As I said, I hadn’t been there in well over 30 years, and none if the people I was with (including my wife) had ever been there. Oh, I think all that green space is far better than more high-rises or new-construction townhouses. The elevators (there are two) run up inclined shafts instead of straight up and down. There are only 20 such elevators in the USA. I’m pretty sure another one of those elevators is at the Huntington Metro. 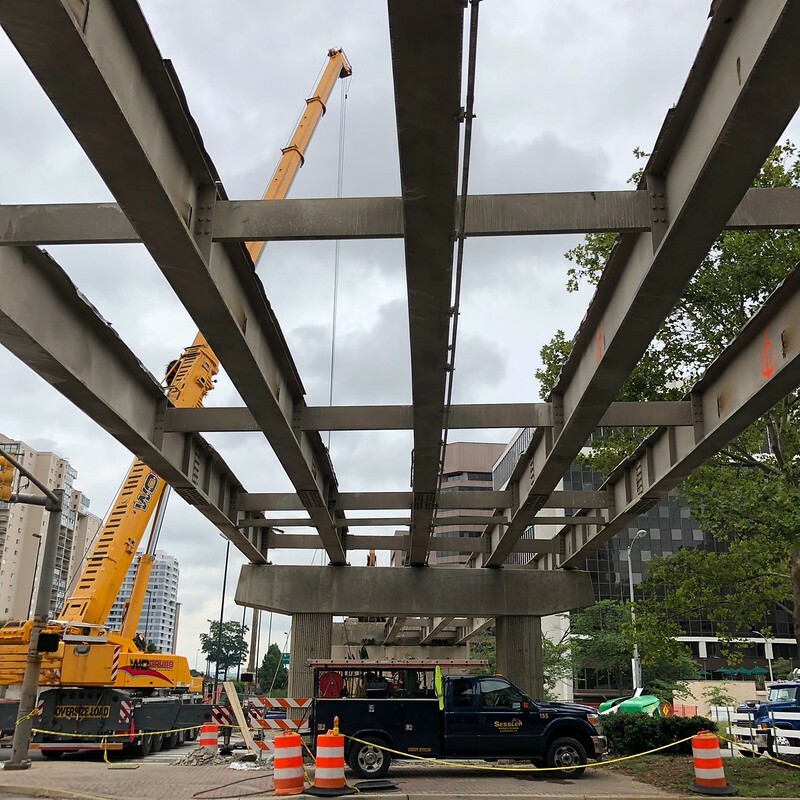 The deck of the S. Clark Street bridge in Crystal City is gone. It's gone and it ain't coming back, part of a Crystal City renovation effort by Arlington County. Speculation is Amazon HQ2 will wind up in this neighborhood. Photo from the Arlington County Department of Environmental Services. More photos of the demolition process are in their Flickr album. According to a community newsletter, Alexandria is going to impose no-right-on-red on southbound S. 28th street, leading onto King St westbound (https://www.google.com/maps/@38.8400656,-77.1056504,3a,75y,241.75h,86.78t/data=!3m6!1e1!3m4!1sgSHs9td4XUVfIS00roZnHA!2e0!7i13312!8i6656), as well Park Center Dr, leading to King St eastbound (https://www.google.com/maps/@38.8370299,-77.1027965,3a,75y,55.18h,87.65t/data=!3m6!1e1!3m4!1s2kJx83iddvSkmz7UkfNdWA!2e0!7i13312!8i6656). As you can see from the GSV, both of these intersections had the vague "No right on red when pedestrians are present" rule. This is part of a larger citywide effort (Vision Zero) to improve road and crosswalk safety. I have a personal connection to the 28th Street intersection, as I was hit in the crosswalk by a right-turn-on-red back in 2015. Regarding the US-1 discussion further up the thread, I just looked at Google Maps to check traffic info heading to the Caps game and I see they (unlike Apple Maps) have replaced the name Jefferson Davis Highway with Richmond Highway—but they incorrectly show the change as extending into Arlington County and on up Route 110 to Rosslyn (it applies only in Alexandria). I have no idea whether the signs have been changed on Alexandria's part. We used that road on Dec. 31 coming back from a game, but of course the name change hadn't taken effect and there was no sign of any sign-replacement efforts. I doubt we'll go that way on our way home tonight unless something unusual happens on the highway. ^ A Patch article says that signs (as of last Thursday, the 3rd) are now posted.